German design brand ClassiCon is celebrating 25 years of a fruitful collaboration with minimalistic German designer Konstantin Grcic. To mark the occasion the 'Black Edition' gathers together some of Grcic's most iconic pieces for ClassiCon and relaunches them in jet black emphasising their angular sculptural shapes. We've fallen for the classic 'Diana' series of side tables which has been now been given the nocturnal treatment. There are three versions to choose from, each one subtly different from the other as Grcic bends and folds sheet steel in this truly modern classic. At the other end of the spectrum, French designer Victoria Wilmotte has folded high-gloss polished stainless steel into a covetable side table that glows like a precious gemstone. 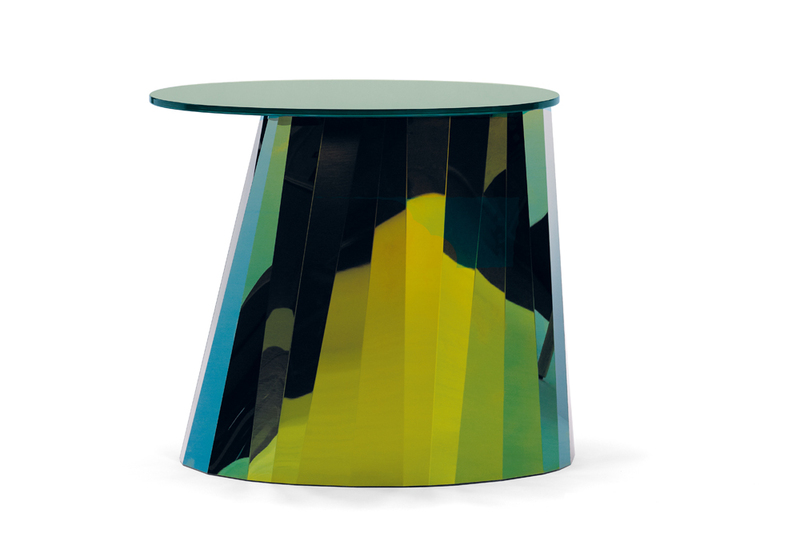 The faceted base of the 'Pli' side table for ClassiCon sports seductive reflections while the cool crystal glass top is a calm pool of colour. For maximum 'oooh' factor head straight for the bewitching glow of topaz green or sapphire blue.